Sold in August 2016, the 33.7 metre Hakvoort motor yacht Sagamar is back on the market, renamed Checkers and listed for sale by Sean Doyle at Northrop & Johnson. 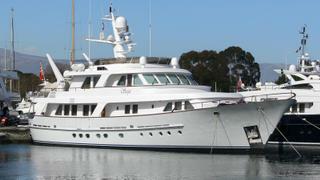 This Dutch yacht for sale was delivered in 2002 with world cruising capabilities central to her design principles. As a result she has a transatlantic and transpacific cruising range carrying 55,000 litres of fuel and full MCA certification. Care was also taken to ensure minimum noise levels, both at anchor and underway, to ensure that guests can sleep while making passage. Her comfortable interior provides accommodation for eight guests, with a main deck master stateroom, a generous VIP stateroom and a further two twin cabins. Her owner’s suite is particularly impressive with a dedicated study and a clever layout which ensures discreet access for crew. She also has accommodation for six crew in three cabins, with en suite showers, and a large crew mess. Her staircase is set within a triple height atrium and has a sky light at the top which brings light into the centre of the yacht at all levels. Her main saloon has a homely atmosphere and features large bevelled edge glazed sliding doors that open into the light atrium. Her decks offer multiple spaces for enjoying al fresco living and watching the passing scenery. She has a large table main deck aft which can comfortably seat eight. Checkers features a dedicated laundry and proper walk-in fridge and freezer rooms to ensure that provisioning is not a problem for longer voyages. She is fitted with Twin Caterpillar 3406 engines and two 80kw Northern Lights generators.